Need a map or report about geology in the state? The Wyoming State Geological Survey (WSGS) welcomed three new staff members at the start of 2018, all of whom bring with them a wealth of knowledge and experience in geology that will benefit current and future Survey projects. 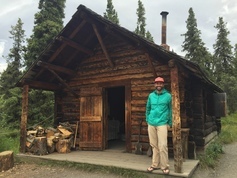 Before arriving at the WSGS, geologist Charles “Chuck” Samra spent a decade exploring for gold and copper deposits in Alaska, Nevada, Arizona, and Montana while employed by Kennecott Exploration and small independent junior companies. He also worked a couple of years in the oil and gas industry, based in Denver, Colorado, focusing on evaluating and interpreting major unconventional basin plays. His interest in geology started with a desire for being outside. “I like exploring and learning about the formation of my natural surroundings and learning as much as I can about the earth system,” he says. 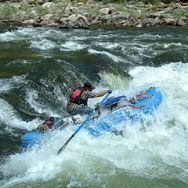 When he isn’t working, Samra is still outside skiing, rafting, and exploring with his dogs. He is looking forward to exploring Wyoming and becoming familiar with its geology, as well as being a part of the WSGS’ future. “I hope to expand on the contributions of world-class geologists who have worked for the agency,” he adds. He is already assisting with WSGS’ StateMap projects and a Greater Green River Basin salinity study. Samra earned a bachelor’s degree in geology from Western State Colorado University and a master’s degree from Northern Arizona University, where he studied Miocene deformation related to the Las Vegas shear zone and the evolution of the Central Basin and Range geologic province. 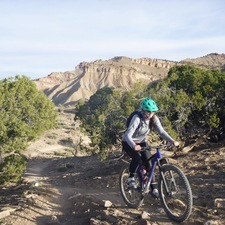 Kelsey Kehoe is the Survey’s new coal geologist. Before coming on board, she was a geologist at WellDog in Laramie, Wyoming, where she worked to develop spectroscopic methods for characterizing organic matter in sedimentary rocks. She also previously worked as a contractor at the Illinois State Geological Survey where she evaluated reservoir quality. Kehoe holds two geology degrees – a bachelor’s from San Francisco State University and a master’s from the University of Illinois Urbana-Champaign. She fell in love with geology after realizing it was the driving force behind landscapes she experiences every day. “Being able to understand what influences the natural world around us fascinates me,” she says. Kehoe has begun assisting with the new online mines and minerals map and is looking forward to developing coal-related projects in the Greater Green River Basin. Dr. Jesse Pisel is a new oil and gas geologist in the Survey’s Energy and Minerals Resources Division. He earned a bachelor’s degree from Western State Colorado University and a Ph.D. from the Colorado School of Mines, both in geology. He spent last summer as a rig site geologist for Midas Gold Idaho in Stibnite, Idaho. Before that, he was a research assistant at the Chevron Center of Research Excellence at the Colorado School of Mines for three years. Additionally, he completed internships with oil and gas companies WPX Energy in Denver, Chevron in Houston, Texas, and BP Alaska in Anchorage. Pisel was drawn to a career in geology because of the opportunity to solve complex problems using science and getting to spend plenty of time outside collecting data. “I am excited to work with people who are so enthusiastic about geology and that my job will directly benefit the people of the state of Wyoming,” he says about joining the WSGS. The first project he is involved in is updating the online interactive oil and gas map. His hobbies include mountain biking, data analysis, and spending time with his girlfriend and two dogs. 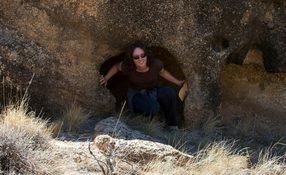 WSGS geologist Dr. Ranie Lynds has spent the last six years in the Energy and Mineral Resources Division and recently became manager of the department. 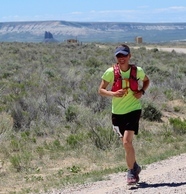 She replaces Dr. Erin Campbell who now serves as Wyoming State Geologist and director of the WSGS. Lynds has already accomplished her goal of filling vacant positions in the department with the recent hiring of coal geologist, Kelsey Kehoe, and oil and gas geologist, Dr. Jesse Pisel (see article above). 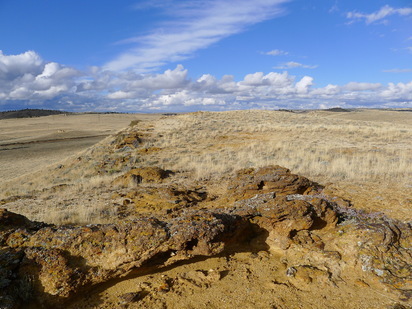 Other goals include working with the department’s five geologists to facilitate collaboration within the agency and across Wyoming to ensure the WSGS is providing the most relevant geologic information and interpretations to the state. “My personal goal is to further my knowledge and understanding of Wyoming’s Upper Cretaceous stratigraphy and hydrocarbon reservoir potential – complicated but worth the effort in terms of state resources,” she adds. Lynds holds a bachelor’s degree in geology and a master’s degree in geophysics from Stanford University and a Ph.D. in geology (specializing in fluvial sedimentology) from the University of Wyoming. In her half dozen years so far at the WSGS, she has been involved with large projects resulting in several publications. This includes a technical memorandum on the geologic storage assessment of carbon dioxide in the Laramide basins of Wyoming, a report on stratigraphy and hydrocarbon potential of the Fort Union and Lance formations in the Great Divide and Washakie basins, an online oil and gas map, a report on the correlation of the Upper Cretaceous strata of Wyoming, and numerous 1:24,000-scale maps throughout the state. Rachel Toner was recently hired as a senior geologist in the Energy and Mineral Resources Division. She has worked as a project geologist in the same department for five years. During that time, she was instrumental in several WSGS projects including converting the popular Oil and Gas Map of Wyoming into an online format. She also published a report on Codell Sandstone oil production in the Wyoming portion of the Denver Basin, and assisted with StateMap projects and with Consensus Revenue Estimating Group, or CREG, forecasts. Toner holds bachelor’s and master’s degrees in geology from the University of Wyoming. She says she fell into geology accidentally. It was then, Toner says, she decided to keep taking geology classes and change her major. “Although I didn’t focus on oil and gas during my undergraduate and graduate studies, I saw how important it is to Wyoming’s economy, and because I also wanted to continue living in Wyoming, I subsequently pursued employment where I would be able to work in and study the state’s oil and gas geology,” she says. A report recently published by the WSGS evaluates select silica-rich sand deposits found throughout Wyoming in bedrock, dune, and alluvial fan exposures found near major transportation corridors for potential hydraulic fracturing proppant material. In hydraulic fracturing operations, proppants hold fractures open in the subsurface, facilitating improved recovery of hydrocarbons. Proppant sands are expensive to transport, therefore locating a source in proximity to areas of petroleum production is beneficial. WSGS geologist Andrea Loveland analyzed sands for silica content, grain size and shape, turbidity, acid solubility, and resistance to crushing – properties critical to hydraulic fracturing sands. Loveland says results show sands selected for evaluation have potential for use in shallow hydraulic fracturing applications, but she did not find higher-quality sands typically used in hydraulic fracturing operations at greater depths as is the case in most unconventional reservoirs. The report is available as a free download. The WSGS is creating a statewide map that will display landslide susceptibility. The project compares slope to rock strength, creating a general understanding of the sensitivity of an area to mass wasting. The project was developed to provide direction to future landslide mapping initiatives by the WSGS. Seth Wittke, manager of the Hazards, Mapping, and Water Resources Division, and natural resource analyst, James Stafford, are heading up the project, which is expected to be completed in April 2018. The Gas Hills uranium mining district in Fremont and Natrona counties has produced more uranium oxide concentrate (more than 100,000 million pounds) than any other district in Wyoming and is the focus of a new WSGS investigation. Although the area has been extensively explored and mined, considerable uncertainty remains as to the full nature of reductant(s) leading to uranium precipitation. Oxidized, uranium-rich groundwater is thought to have traveled along the more permeable subsurface conduits and precipitated uranium minerals in pore spaces and as grain coatings in reduced environments. The goal of this study is to examine mineral assemblages in and near some remaining ore zones to learn more about geochemical and mineralogical reactions, which may have contributed to the reducing environments in which uranium was ultimately deposited. Geologist Robert Gregory is conducting the study, which is slated for completion in summer 2018. WSGS geologists Dr. Ranie Lynds and Rachel Toner, along with Joshua Slattery of the University of South Florida, will present their poster entitled "Unconventional Oil Exploration in Wyoming Using Regional Chronostratigraphic Correlation" at the American Association of Petroleum Geologists Annual Convention and Exposition (AAPG ACE) in Salt Lake City, Utah. The poster is part of a session on Unconventional Systems of the Western United States, and will be on display Tuesday, May 22, 2018. More information on AAPG ACE 2018 can be found at http://ace.aapg.org/2018. Planning an adventure this summer and need a map? Interested in learning about energy resources or minerals in Wyoming? Geologists at the WSGS have published hundreds of maps, reports, and other publications on a variety of topics related to geology in Wyoming. Most of these publications are available as FREE downloads on the Survey's sales site. Hard copies can be purchased on the site as well. Combined with other organizations, such as the U.S. Geological Survey, there are more than 4,300 products available on the site to choose from.